Another shot of the Chateau des Beaux-Arts, designed by Delano & Aldrich c. 1905 in Huntington intended as a recreation facility which would have included a restaurant, hotel, dock, bathing and tennis facilities, polo fields and formal gardens. The project was never fully realized. 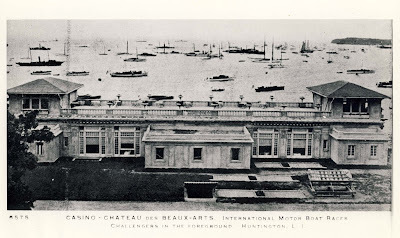 Click HERE for more on the Chateau des Beaux-Arts. Picture courtesy of SPLIA. I had no idea about this project! What a handsome design and such a departure (use-wise) for D&A. and look at all those beautiful yachts in the harbor. be nice to have a closeup pic of those - i bet all the players were there. a beautiful place and too bad it was never finished. i take it the town still uses it as rec facility?